Hey guys. So for a while now our speeds have been shocking and on Wednesday my Mum rang Telstra our ISP and they run tests and according to them they recorded speeds of 3mbps - 6mbps yet when I run a speed test I am lucky to get anywhere near that, They have sent out a new modem/router which should arrive on Tuesday (Public holiday Monday). Could our current ISP router be the culprit, Could it be the line running to our home, Could it be that there is a lot of devices connected to the network? Below is a Speedtest I've ran and we pay a lot of 500GB and for so called "Fast - ADSL2+" internet.. I had the same problem with Dishnet. Speeds were fine and then cripplingly slow, they sent someone out with a new router and that fixed it. So yeah I'd say it's the ISP's router. 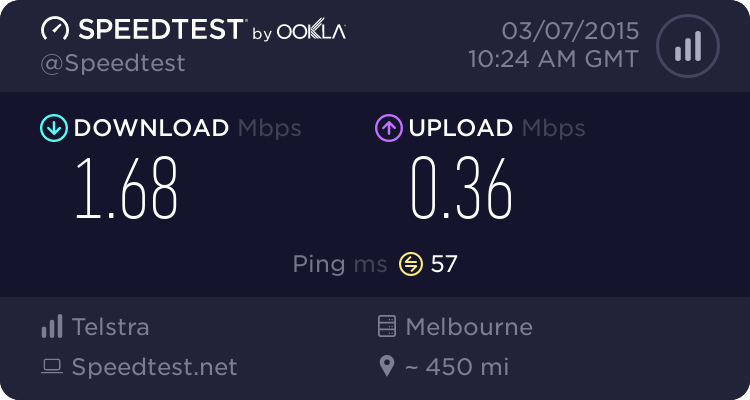 Speed tests can very depending apon what time of day or night your doing your test due to high traffic.Also your low speeds could be due to other factors like two or more being on the web at the same time. If all else fails, getting a new router could solve your problem.I ran into that problem once of getting low speeds.My line was fine so they replaced my modem and the problem went away. I ran the test on my laptop of course. BK, have you called up you ISP and have them run a check on your line? Or do you have cable? Either way, if your line checks out to be fine then it's probably the router. Yeah they did that before they decided to send us out a new modem and they got speeds of 3-6mbps. It should be here today hopefully.. Awesome man, glad to hear. Also one time I was getting really low speeds on my modem so I called up my ISP and had them run a check on my line and they told me that something was wrong with my line, so they said they would send out a tech to check out my line.Turns out that squirrels had been chewing on my outside line.Long story short they replaced my line with a new one and didn't charge me anything, and my speeds went back to normal. I am on the phone right trying to find out what is going on. Squirrels chewing on the line eh lol..
Ok so the consultant on the phone tells me that modem/router was never dispatched from the warehouse despite telling us it was with Australia Post so we are going to pick one up from our local Telstra shop..